Texas Freckles: Yes, I've been a bad, bad blogger. Yes, I've been a bad, bad blogger. Life is good, I've just been crazy busy. I've been working, quilting, sewing, teaching sewing, gardening, working on my house, and serving on a very active PTA board for the first time in addition to my wife and mother responsibilities. Sixth grade has been a major transition for my daughter, but she is doing really well in school and I'm so proud of her. The drought and weather here in Texas has been completely devastating. We've had the hottest and driest year in Texas history. 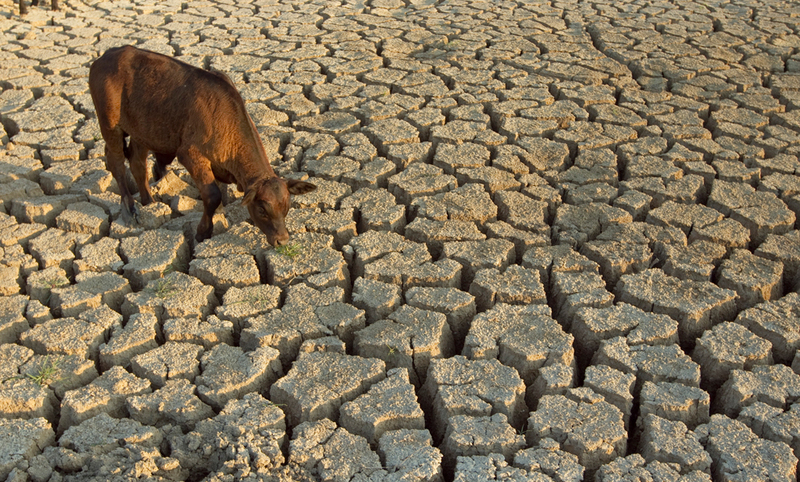 Wildfires, dead and displaced cattle and livestock, withered crops, and parched soil. It's really heartbreaking and the outlook isn't good. Forecasters tell us the situation isn't going to improve anytime in the foreseeable future. I'm trying to think of something positive to end this paragraph with, but I'm completely at a loss. The impact of 2011 on our landscape, lives, and economy will be profound. On a happier note, I finished a quilt! This is the quilt I started in my previous post. It's completely over the top and I just love it. This quilt is for my cousin's gorgeous daughter, Teagan. I wanted to make something as delightful as her smile. I quilted it with bright colors of Perle cotton and tied it with some hot pink for a little extra hold. Everything except the binding is dots. I was surprised at how easy it was to pull a dots quilt together from my stash. I must have a serious love of polka-dots. Teagan evidently really likes her quilt and I hope she gets years and years of use from it. So, if you are reading this, I'm guessing you haven't deleted me from your blog reader due to inactivity. I'm going to make an effort to post more regularly and I've got lots of fun things to post about. It's good to be back. I love the dots, so cheery and happy! We live in East Texas. We gave away 18 horses about 2 months ago because we didn't see where we could get hay this winter for them. (some of the finest bred quarter horses in texas i might add) Yes, it has changed our lives. I have missed you! Glad life is good and I'll be patient to see some of your beautiful work! I love the polkadots! What a wonderful quilt! Really love the perles and ties together like that. Sorry to hear about the weather. It is changing worldwide, no doubt about it. I am looking forwar to seeing your work. I hope things in Texas will get better for you. I was complaining about our lack of rain here in NC but after reading this I think I will be keeping my mouth shut. Doesn't it break your heart when something you have no control over causes so much despair? The weather is certainly a cruel master. We have recently come out of a 12 year drought which only ended with the worst bush fires we have ever had. I hope that your wonderful state has rain soon. On the positive side, your quilt looks wonderful. It's bright, cheerful and colourful. Love the quilting in perle. Such a wonderful gift. Welcome back. And that quilt is gorgeous. Hey, I think 'over the top' quilts are just FANTASTIC!!!! I.LIKE. receive some rain. We've had 1 inch of rain since last OCT....you are right....it's just been unbelievable!!! Good grief, that's a heartbreaking photo of that poor cow. I was complaining this morning about us having MORE rain (Autumnn in Scotland - what do we expect?!?) but am shutting up now. It's gloomy to look at but not harmful! LOVE LOVE your quilt. 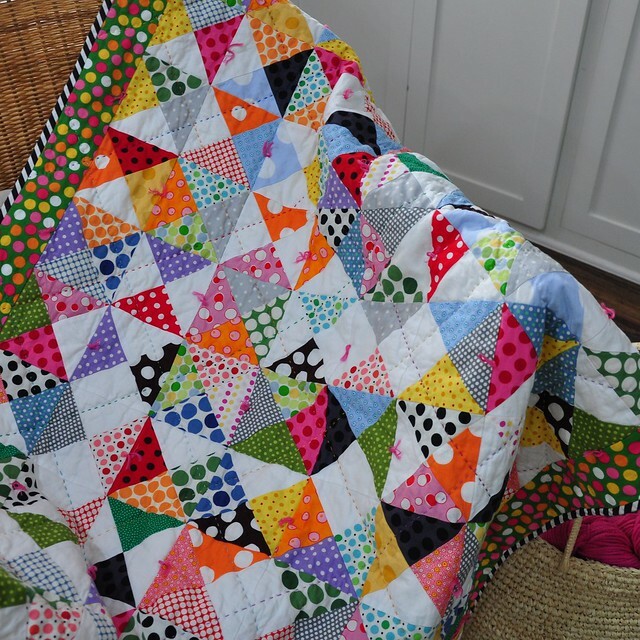 So happy and bright - the handquilting really is the perfect finishing for it. great quilt! wouldn't ever delete you! I'm crazy for polka dots and I seriously LOVE this quilt. A beautiful blanket for a girl with a beautiful name! I am quite sure this will be cherished. It is truly lovely! I like the quilting in pearl cotton. That looks so nice with the bright fabrics. I am a Texan too and I agree that this summer has shown not a shred of mercy. I went walking this morning IN THE RAIN. I could hardly believe how intoxicating it was. I left the house and was only a short distance when the gentle rain started. I couldn't bring myself to turn back. It has been so long since we have had this in Texas that it was like therapy. I just kept walking and enjoying every second!!! Welcome Back! I can't wait to see what other projects you have been working on. 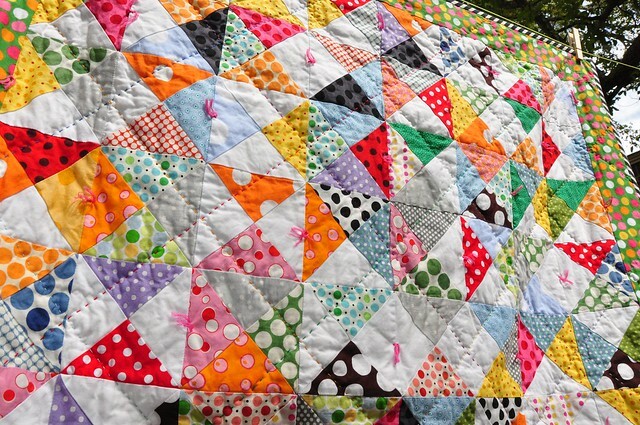 Great dotty quilt - I am sure it will make your niece smile every time she looks at it! 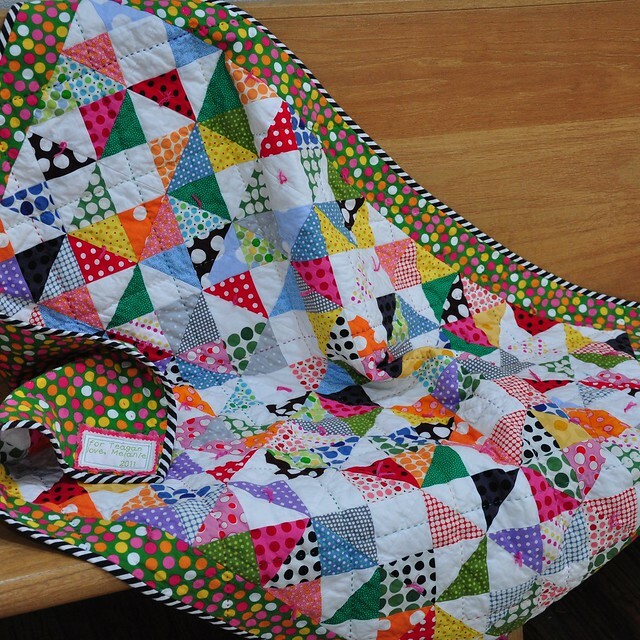 It is lovely to hear from you and I absolutely love that quilt! Makes me want to rush home and start a 'polka dot only' quilt too. I'm so sorry to hear about the terrible drought problems in Texas, I didn't know this was still such a bad problem for you. At least that is something I will never have to worry about as it rarely seems to stop raining here in Scotland - if only we could send you some! What a fun quilt! So colorful. The quilt is fantastic!! Did you hand quilt with the pearl thread? I love love love that quilt! It's so happy and cheerful. Teagan is a lucky girl.